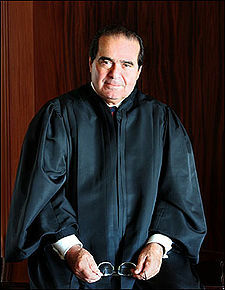 Justice Antonin Scalia has once again earned himself the ire of law students. Not long ago, Scalia was clearly out-of-line in slapping down a law student for a perfectly reasonable question. Now, he is being quoted in telling students out of the top schools that, no matter how hard they work, they will probably never have a chance for a Supreme Court clerkship based entirely on their school. He basically threw the student a quarter and told her to call her mama and tell her that she was never going to be a Supreme Court clerk. Salia was speaking about administrative law at American University Washington College of Law on April 24 when he was asked by a student what she would have to do to become “outrageously successful” without “connections and elite degrees.” He responded with an example of arbitrary and capricious reasoning in administrative law. The scene is now something of a signature moment for Scalia. Of course, it is true that justice rarely interview people out of the top law schools. However, that has less to do with the quality of the students as the bias and frankly laziness of the justices. It is ridiculous to believe that the top student at a school like American (ranked 45th) would not be competitive with the students at these other schools. More importantly, the justices should feel an obligation not to replicate this monopoly system. They hold one of nine positions on the highest court for the nation. They should act to look at students across the country and among the various schools. Instead, Scalia basically follows the approach of Chicago Alderman Timothy O’Sullivan who once was asked by a young eager college student named Abner Mikva if you could volunteer on a campaign. When O’Sullivan asked “who sent you?”, Mikva responded, “Nobody.”. O’Sullivan responded with the classic: “We don’t want nobody that nobody sent.” O’Scalia’s approach to merit hiring is little better. Wow, what a bunch of whiners. Look, Scalia is right. Typically, the best and brightest get in to the elite schools. If you were a busy justice and didn’t ant to waste time, it would make sense to choose from schools where you have a high likelihood of finding multiple candidates with the best and brightest credentials. Like it or not, that’s how it is. You want to clerk for a SCOTUS judge? Go to a top 5 school, or have connections- preferably both. Question to Elana Kagan on Don’t Ask/Tell Recruitment: US Recruits are not informed of Bush-created $25 Death Sentence Rewards for Captured US POW, which caused death of my nephew, PFC Kristian Menchaca, who was captured with PFC Thomas Tucker in Yosifiya, Iraq, 16 June 2006, both barbarically tortured to death as a consequence of Blood Money deficient Life Rewards which are not explained to recruits. Terrorists continue video recordings of the tortures on the Web. U.S. Reward fund wrongfully applied by the Bush administration clearly contributed to the torture deaths of captured U.S. soldier Prisoners of War denied Fourteenth Amendment equal protection of higher US offered $5 million each (average Reward life values for Terrorists) to $25 million (bin Ladin & Zawahiri) Bush assigned to captured Terrorist POW, but denied & diverted away from U.S. soldier Prisoners of War. PFC Kristian Menchaca & PFC Thomas Tucker were tortured to death as the consequence of insufficient 14th Reward life values (obviously insufficient Blood Money as viewed by Muslim culture) manipulated by Bush Administration; &, these insufficient Reward life values did contribute to the War Crimes applied by Muslim Terrorists against all 100% of captured U.S. soldier Prisoners of War in violations of the Third Geneva Convention of 1949. U.S. soldier POW would have survived if accorded their 14th Amendment equality of same Reward life values as captured terrorist Prisoners of War. Survival statistics clearly show 100% of U.S. soldier Prisoners of War denied equal protection of Reward life values were tortured to death & murdered (except Bowe Bergdahl) while virtually 100% of captured Terrorists with higher Reward life values survived capture. Of question: US diversion of U.S. Corporation donated Reward money that saved the lives of Terrorists while that same money was manipulated away from higher Reward life values for U.S. soldiers tortured to death. rafflaw – There isn’t a Princeton Law. Law school does not prepare you for the bar exam. You have to study for the bar exam separately. So, why shouldn’t all lawyers have to take the same bar exam? Your point makes absolutely no sense. Frankly I don’t know what all the uproar is about. Scalia was just stating a fact. If you would rather have a sugar-coated fantasy view of the world then that speaks more about your intellectual failings than Scalia’s. Re Anon23: interesting idea, although I don’t think it’s Congress’s place to tell judges how to hire their clerks. One minor hitch, though: as a DC resident I don’t have a senator. Scalia is so emboldened as to be able to do and say whatever he wants. There are no checks and balances anymore. The Supreme Court is the finest money can buy, they install their preferred president, rule routinely for Exxon & the rest and literally ridicule the people who come before them like the girl with the advil in her shorts. Where is Marbury vs. Madison when you need it? The network news is on and some news anchor attributed the decision to not wanting to inflame the public or put our troops in more danger. This to me isn’t about limiting damage IMO, it’s determining where the damage will fall. This issue poisons the Justice Department, the Intelligence Community, the relationship between Congress and those communities and various Departments and the relationship between the Executive/Congress and the citizens. This is the defining test for this generation regarding the rule of law. The political carnage that comes from a full investigation would be massive but that’s a lesser effect than a failure to release the photos and documents and proceed with a full investigation. A failure to proceed would cut the heart out of the country’s self image and projection to the world that we maintain some persuasive level of moral leadership. It would also damp down, if not entirely curdle the re-newed pride and hope a large segment of the electorate went to the polls to validate. Lastly IMO, it would validate the appearance of a two-tier system of justice. Yes, I agree with you on this, it was a very clever remark. Unfortunately it says that just getting into one of the premier skills is such a high level of accomplishment that a lesser education at that institution can not diminish the virtue of the caliber of the student and by extension, the students value. That’s assessment may be true on a case by case basis but as a rule it’s elitist and foolish. It’s not exactly the kind of critical thought I like to see coming out of a SCJ but Scalia has never hidden his predjudices. Scalia obviously believes that he is cute with his snarling comments in his opinions for the Court, directed not only against parties litigant but to his colleagues on the Court as well. If this is untrue, then why does he persist in his arrogance? Worse, he thinks he’s impressive at the same time. He’s the Court’s contribution to the world of know-it-all jerks with big mouths who are found everywhere from the sleaziest bar to the plushiest university club.